You may not know this about me, but I'm a total Swedophile. I love Swedish music - from ABBA to Peter Bjorn & John to my latest obsession with Lykke Li. I love Swedish furniture and its ability to remain functional and stylish all the time (including, but not limited to, IKEA). I love Swedish architecture, like this amazing one room micro home that's definitely 'at one' with nature. I love my Swedish friend Örjan and his wry sense of humour. 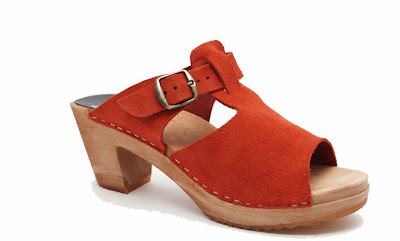 My latest Swede-infatuation is with my clogs. Our love affair has been going strong for about six months now and I don't see it ending anytime soon. I'd wanted a pair for years, and when I finally brought them home I quickly learned they added that certain something that had long been missing from my wardrobe. I wear them with denim, with minis, with tights, with shorts, dressed up and dressed down - I'd never imagined such a unique style would complement so many outfits. As an added bonus, they're kind to the earth, too. 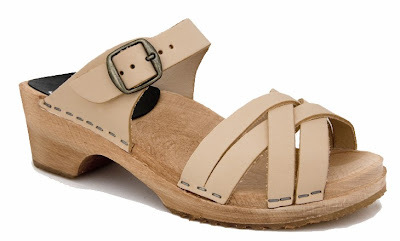 Funkis clogs are produced using only natural products including sustainable plantation timber and leather treated with vegetable dyes. The Funkis label has embraced a range of other sustainability practices that include packaging reduction, use of 100% green power and development of an organic cotton range of fabrics; they are also working toward carbon neutral status. You can read more about why Funkis is an eco-amazing company at one of my new favourite websites, How Big Is Your Eco, or on the Funkis website. As an eco-savvy shopper I have resisted the urge to buy a dozen more pair (Reduce, Reduce, Reduce! ), but I think I may crack soon - how can I possibly resist these gorgeous pieces of wearable art! ?